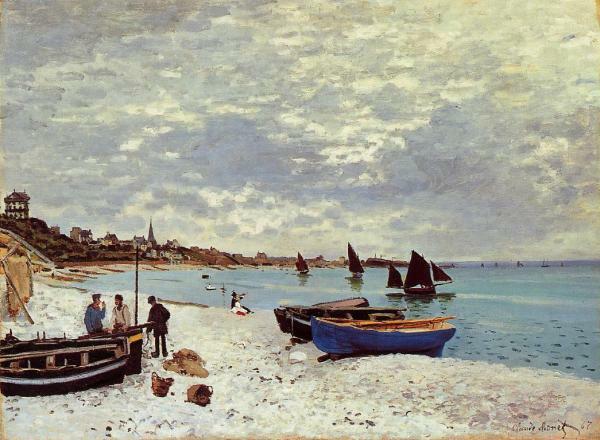 Claude Monet, "The Beach at Sainte-Adresse"
"The Beach at Sainte-Adresse", Claude Monet 1867, oil on canvas 75 x 101 cm, The Art Institute of Chicago, Chicago Illinois USA. Sainte Adresse is a location close to Le Havre. Monet was aged 27 when he painted this view of a beach near Le Havre, on the norman coast of France. His parents lived at Sainte Adresse. Monet was fascinated by boats as well as seaside or any form of water. The Reader also known as Springtime, Claude Monet 1872, oil on canvas 50 x 65 cm, The Walters Art Museum, Baltimore Maryland USA. "Garden at Sainte Adresse", Claude Monet 1867, oil on canvas 98 x 130 cm, Metropolitan Museum of Art, New York USA. Sainte Adresse is a location close to Le Havre.